In my work, I am most interested in the skill and technique that is involved in art making. I find the finished product to be important, but the process behind this work is often what inspires me to create. My work is influenced by the specific properties of metal and fibers, the materials I work with. This is important because the materials I use will often present me with a challenge of how I can connect them, due to their opposite natures, and the separate processes used with metal and fibers. 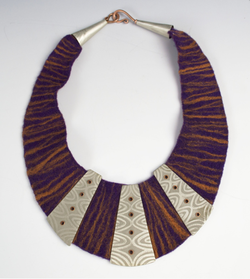 I create wearable art jewelry using a combination of fine metals such as copper and silver and felted wool. Because of the natural quality of my materials, nature and organic forms are something I often draw on for inspiration and it is a great influence in my design choices. Despite both being natural materials, metal and felt have seemingly opposite properties. Contrasting these opposite properties is a large part of my jewelry work. I like to place different textures, colors, finishes, and shapes next to contrasting elements to highlight those very differences that make them unique, as well as creating a bold statement. Using the softer, earthy texture of hand felted wool with smooth, polished metal is one way I like to explore these materials. I am currently focusing on using fibers processes in metal, such as crocheting and knitting wire, as well as using felt in combination with metals, as accent pieces or often linkage. What interests me about the two is how despite seemingly being opposites, there are many processes and results that can overlap, or can be related to one another. I enjoy the challenge of combining two dissimilar materials, as well as the practical challenges of working with both techniques to create unique, unified pieces of jewelry.